Roddy White didn't shy away when talking about the offensive struggles the Falcons have been dealing with recently. The Atlanta Falcons may be sitting at 6-1, but apparently not everyone is feeling great about their impressive start to the 2015 season. 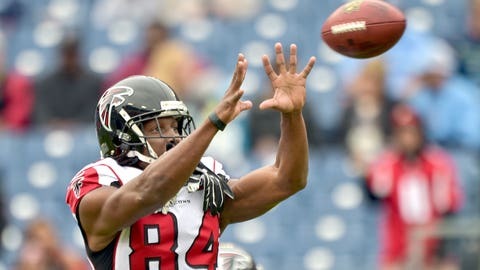 According to Vaughn McClure of ESPN, veteran wide receiver Roddy White knows that his team is capable of playing even better than they are. "We’re in a funk right now on offense, and we’ve got to play our way out," White told ESPN. "We’ve been struggling, so we have to find a way. We’ve got to keep grinding." He didn’t stop there, talking about what would happen when the team goes up against someone like the Carolina Panthers. "People might not care about this game in a couple of weeks, but we care because we know we can be better. … I felt like we had maybe two drives that were good out of . We had two the whole game. And the rest were penalties or little setbacks that got us down and distances that we couldn’t recover from. We just have to find a way to get out of this funk before we get to a team like Carolina that is really good, that when you get behind the sticks, you’re going to get blown out." Interesting to hear White’s input, and there’s obvious reason to agree to some extent with what he’s saying. The Falcons struggled offensively against the Tennessee Titans in Week 7, winning just 10-7, largely thanks to some strong defensive play.